Esta encantadora casa tem todos os confortos para qualquer família ou dois. Quer se trate de café no deck para pegar o nascer do sol, grelhar no pátio para uma noite relaxante, ou assar s'mores sobre uma fogueira. A sala de estar náutico que tem vista para o lago é um grande ponto de encontro para os adultos. Os adolescentes podem relaxar na sala de família com mesa de jogos e lareira. Dois quartos têm camas queen eo dormitório tem quatro beliches. Não se esqueça seu protetor solar. No Silver Lake há uma abundância de actividades aquáticas com praia de areia, dock (para atracar seu barco), nadar jangada e barcos a remo. Serviços: A casa tem uma cozinha totalmente equipada, incluindo microondas; uma espaçosa sala de jantar com capacidade para 12. Há uma lavadora / secadora. Todos os lençóis estão incluídos. Área: A casa fica a poucos minutos do centro de Traverse City, numerosos campos de golfe, restaurantes e lojas. Passeios belo dia para Mackinac Island, a Wine Tour Leelanau Península Missão Velha ou são sempre uma opção. The house is a perfect home away from home when you don't have a Northern Michigan home of your own. The house is very clean and well-kept, stocked with everything you need (plenty of towels, kitchen appliances, etc). The 8 bunk bed room is like a big slumber party! We loved that they had kayaks/paddleboat for us to use all weekend as well as a bonfire pit. Another great feature, it's only about 15 mins away from downtown TC. Couldn't have asked for a more perfect home for our weekend away!! Stay here! You won't regret it! The was our 2nd year staying at this lovely cottage and it was another wonderful one!!! Great TC weather topped off our great stay at this wonderful, homy cottage!! 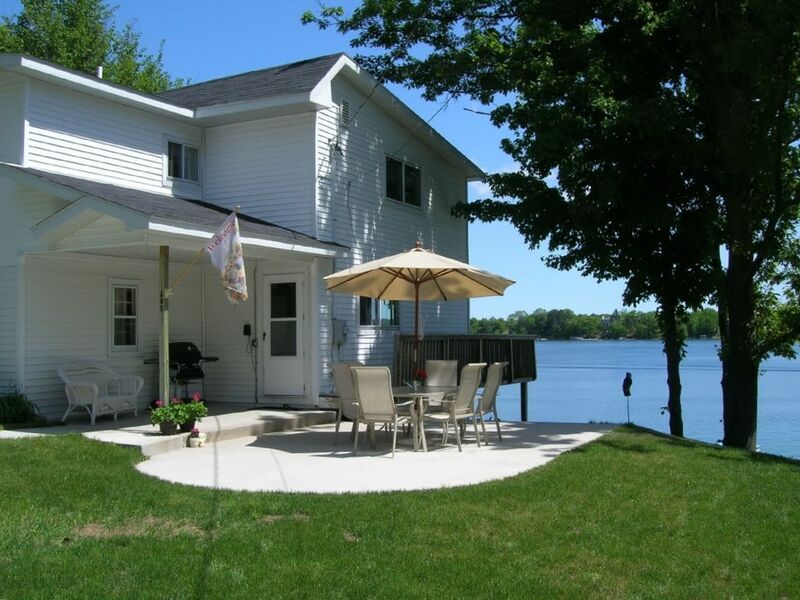 -Situated on a fantastic lake (it's warmer than the bays, very clean! -To us, the only real drawback of this house might be the landscaping just on the yard facing the lake. This house is absolutely adorable and, while it does not at all effect the functionality of the house, the clearing out of the property that sits on the water (going up both sides of the hill and around the basement area) would make this property so attractive. This is really the only reason we gave this home a 4 out of 5 stars. I wouldn't even really list the landscaping as a "con", but I figured people would think it was too good to be true if there weren't at least one! If you are a family looking for a wonderful vacation spot, this truly is the place for you. Silver Lake is beautiful and, for us, it's a nice break from the traffic of downtown TC. You're close to it all, but far enough away to have a peaceful vacation!!!! Thank you to the owners for another wonderful stay! The most "at-home" I've ever felt while away from home! This is our 8th year coming up to Traverse City but our first year venturing outside of the world of hotels. This cottage beyond met our expectations. From the minute we walked out onto the large deck over looking the lake, we knew that we had found our little slice of heaven for the week. The house is extremely clean and well-kept. It's spacious, cozy, and oh-so inviting. The room that over looks the lake is breathtaking! It was such a joy to walk downstairs in the morning and be welcomed by the glistening lake! As a family with young children, we loved the bunk room!!! Our son was grinning from ear to ear when he saw all the beds for him to choose from! In addition to the bunk room, the little room that is off of the bunk room was GREAT for our daughter, who is only 1, and still in a crib!!! We were amazed by how well the house was stocked! It had all of the amenities of home, and then some! Dishes, cups, silverware, oven mitts! Honestly, you name it, it was in this cottage!!! The front room of the house (with the television, gaming table, and AWESOME long couch) was a favorite hang out late in the evenings! The deck that overlooks the lake is a great place to relax and have a glass of wine while watching the sun set! The beach was fantastic!! The kids spent the week building sandcastles and watching the sea plane (which we were pleasantly surprised to find "lived" just a few houses down)! The neighbors were also very warm and inviting! The patio was a favorite place for lunches and dinners!! When we were leaving the cottage, we were asked by the caretaker if there was any suggestions we had, anything that could've been in the house that wasn't. Our response? "Don't change a thing!" If you are looking for a family-friendly, free-of-fuss, all-fun cottage, THIS IS THE PLACE FOR YOU! Thank you again to the owners for a wonderful experience! This was our first trip to the Traverse City area and we enjoyed ourselves. The cottage (house) was very clean and the owners and caretaker were very attentive to our requests both before and during our stay. The welcome basket was a classy touch. And I knew we were in for good things when we arrived and saw clearly marked bins for garbage, returnables (it's a Michigan thing), recycling, and "foot bath." It shows the owners care. The kids much enjoyed the massive bed room with the 4 bunk rooms (it's actually 2 rooms). The beach, dock, swim platform, kayaks, paddle boat, and ping-pong table were big hits. So was the fire ring and owner-provided wood. Again, classy. The cottage was, as mentioned, clean and pretty nice. A couple of suggestions (but very minor ones). Maybe a love seat in the basement so the kids can watch TV/movies without having to sit at a table and chairs. Maybe a TV/cable in one or more of the bedrooms for the kids when it's rainy or cold outside. And updating the furniture probably wouldn't hurt, especially in the den - not necessary, but a nice touch. Now a "wish list" suggestion. Having a pontoon boat available to rent would be a huge plus. We recognize that there are marinas in Traverse City that rent them, but we've found that owners who rent boats are more reasonably priced. Overall, the place was very worth the money. We had a great time. If you stay here, you'll be happy, we think. We stayed at this house the week of the Cherry Festival (7/4-7/11) and we could not have been happier. The house is beautiful, incredibly clean, and had all the amenities of home (and then some). We spent most of the week hanging out on the sandy beach, swimming in the crystal clear water, and just enjoying a relaxing getaway. We went into downtown Traverse City a couple of times which is only a few miles away and went to see a Traverse City Beach Bums game, which was awesome. Just a note to anyone traveling with young children--we stayed here with our 2 year old daughter and brought along her pack-and-play to sleep in. There is a side-room attached to the bunk bed room that was the perfect spot to setup her bed without using up one of the other bedrooms. What else can I say--the house (and our vacation) were perfect. I highly recommend the house to anyone looking for a vacation in a home away from home.